Grotecs landscape architects Gold Coast have been assisting developers, builders and residential home owners with their landscape design plan requirements since 1988. EXPERIENCE – We have the knowledge and skills needed to get the job done right,.. the first time! QUALITY – You’ll receive creative, innovative, environmentally sensitive and sustainable hard and soft landscape designs tailored to each individual project,.. perfectly! VERSATILITY – No project is too large or small. We’ll work on the smallest of contemporary courtyards to the largest residential and commercial properties,.. we’ve got you covered! SERVICE DELIVERY – You’ll receive personalised, hassle free service.. on time, every time! VALUE FOR MONEY – Our fees for service are very competitive,… we’ll work within your specified guidelines and budget! 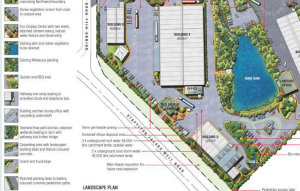 Check out this video to learn more about our Landscape Architects Gold Coast services for projects throughout South-East Queensland and how we can best assist YOU!. Grotec’s landscape architects gold coast team has extensive experience dealing with local councils on landscape intent (BA submissions) and landscape management (OPW & DA submissions) for residential and commercial developments. This ensures landscape design plans and specifications comply with relevant council codes and policies and are completed and delivered to you without delay. We are totally committed to providing innovative, environmentally sensitive and sustainable design solutions that are both creative and feasible. 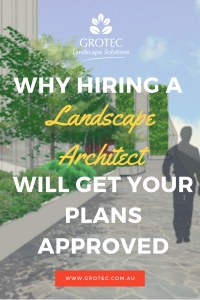 Sites are studied in depth with thorough client, consultant and design team interaction to determine the most applicable and enduring landscape design solutions for client goals. 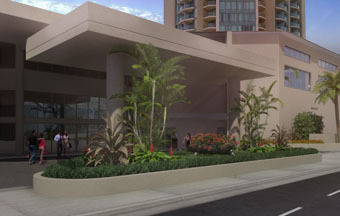 Our landscape architects Gold Coast team use CAD (computer aided drawing) software to quickly formulate a variety of layout options and ideas for consideration at the conceptual stage. Progressive plans with images of hard and soft landscaping ideas and suggested plants are emailed for discussion throughout the design process saving time and money. If you’re looking for landscape architects Gold Coast. Give the Grotec Landscape Design team a try. We have been designing landscapes for commercial and residential properties for projects throughout S.E.Qld for over 25 years. Please call us on 07 5532 5554 or send an email to info@grotec.com.au to discuss your Landscape Architects Gold Coast services today. We’ll provide a no obligation fee proposal to assist you within 24 hours.